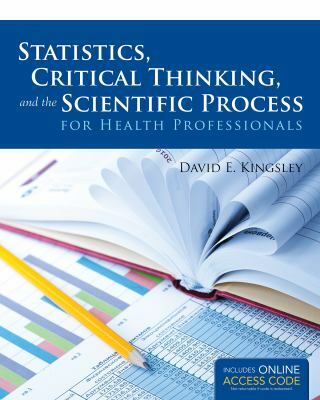 Statistics, Critical Thinking, And The Scientific Process For Health Professionals Emphasizes The Importance Of Applied, Practical Statistics And Critical Thinking In The Scientific Process And Includes Basic Formulas And Calculations For A Variety Of Statistical Techniques. Modeling Concepts Are Clearly Explained, Calculations Are Demonstrated, And Common Errors And Adverse Consequences Of Faulty Reasoning Related To Data Analysis And Interpretation Of Results Will Be Identified And Explained. Students Will Learn The Basics Of Selecting A Correctly Sized Sample Through Reliance On Effect Size, Desired P Value, And Desired Power. This Comprehensive Text Covers The Subject Matter In An Engaging Manner, Including A Large Number Of Tested Pedagogical Techniques That Have Been Enjoyed By Statistics Students Over Eleven Semesters. Critical Thinking Materials Include Explanations, Problems, And Exercises Along With Class Discussion. Features Includes Practical And Relevant Problems And Data Provides Helpful Exercises And Questions Includes Sketches And Graphics Of Scatter Plots And Decision Trees Uses Step-By-Step Application Of The EXCEL(TM) GUI Includes A Supplemental SPSS(TM) Manual.